The caravel of the 15th and 16th centuries was a ship with a distinctive shape and admirable qualities. A gently sloping bow and single stern castle were prominent features of this vessel, and it carried a mainmast and a mizzen mast that were generally lateen-rigged. Although the caravel had already been in use for hundreds of years, it developed into an incredibly fast, easily maneuverable vessel by this time, which was noticed by eminent people. This extraordinary vessel gained fame with the Portuguese and Spanish voyages of discovery. As Inigo Arieta (who escorted Columbus out to sea in 1492), the Commander of the Biscay fleet put it, caravels were ‘’corredoras extremadas, buenas para descubrir tierras (1).” Columbus’s ships Niña and Pinta were supposedly caravels, and Columbus repeatedly praised his favorite ship, Niña, for her great speed, maneuverability, and safety (2). However, as is evident in the historical record, not all caravels were designed the same way, and many changes were made throughout the history and development of the ship. In essence, it is hard to define the ‘pure’ archetypal caravel (3). There is very little iconography that depicts the caravel at any stage of its development, and as of yet there are no extant remains of one of these vessels. However, it is still possible to trace the origin of the ship and study it through historical accounts, shipbuilding treatises, ethnographic studies, and archaeological parallels. It is the purpose of this paper to examine these sources, as well as studies done by various scholars over the years, in order to present the diagnostic features of 15th and 16th century Iberian shipbuilding in general and the caravel in particular. The exact origin of the caravel is a matter of some debate. There are many possibilities and theories, but no conclusive evidence to sustain them. That the caravel was a fishing vessel in the 13th century is evident from Portuguese records from that period. 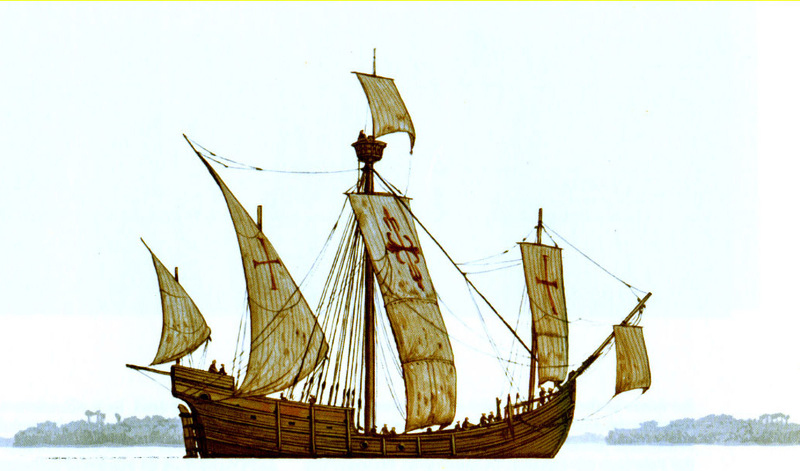 However, by examining the etymology of the word ‘caravel’, it may be possible to trace the vessel’s origin to an earlier time and even another region. Elbl reports that in the early 13th century, the term ‘caravel’ was connected to a small ship related to Muslim Algarvian and Maghrebine models of lateen-rigged craft made to suit Atlantic sailing conditions (4). This qârib was well equipped to travel in shallow waters and was used as a fishing boat, coaster, and light warship (5). Although little is known about the technical details of this small Arab vessel, it had preferred features that allowed it to transform into progressively larger forms, much like the caravel. Because the caravel presumably had some of the same characteristics of the qârib, some speculate that the word ‘caravel’ is derived from qârib, and, therefore, the vessel is of Arabic origin. Spanish and Portuguese scholars, during the nineteenth century, also sought Roman and Greek terms that could have spawned the word ‘caravel’. Jal’s Archéologie navale even suggested an Italian origin for carabela as cara bella, apparently owing to the beauty or grace of the vessel (6). Although possible origins of the word ‘caravel’ were proposed, the scholars found no references to the design and construction of the ships that they were attempting to trace to the 15th-century vessel, except that they were referred to as small, light vessels with good sailing capabilities that traded widely inside and outside the Mediterranean. Despite all of the uncertainty over the etymology of ‘caravel’, the first mention of the Portuguese vessel in an official document was its integration into the English fleet upon its return to Gascony in 1226 (7). By examining the sources in which these early caravels appear, as well as other contemporary ships (with regard to tonnage and build), an indication of the size and capacity of the early caravels can be found. Early sources, such as the floral of Vila Nova de Gaia, refer to the caravel as paying the lowest entry toll on the list (8). By comparing the caravel with the other ships on the list, a relatively small size and capacity can be attributed to this early version of the vessel. Throughout the centuries, this changed as the utilization of the caravel also changed. Although the word caravel may or may not have been derived from an Arabic term, Islamic influences definitely shaped the fate of the 15th-and 16th-century caravel. As Muslims conquered various lands throughout the Mediterranean and Western world, they borrowed learning from the people they subjugated. Unlike other conquerors, they did not simply impose their view of the world on other nations. They amalgamated their philosophies with those of other cultures and thus their conception of the world grew. In this, the Muslims served as conveyors of ideas received from people they conquered. They disseminated ideologies from different cultures and by the end of their reign in the 13th century the world view was much different than the popular ideas of Western Europe. A liberal philosophy induced an enthusiasm for investigation and examination which changed the basis of Iberian life (9). Eventually, this spirit of inquiry compelled the Spanish and Portuguese to explore the vast oceans that were so integral to their lives. It is easy to see then, why Prince Henry the Navigator of Portugal (1394-1460), consumed with expansionist ideals, chose the caravel as the ship to carry out the demands of his journey to the West African coast in the 1440s. Earlier explorers used barks of about 25 tons, which had a single mast. They also experimented with the longer and larger barinels, but neither of these vessels was adequate for the increasingly longer voyages (15). For these reasons, the caravel was summoned to perform the duties of an explorer. Although by the early 15th century, the caravel had highly admirable qualities, it was still far from ideal. The main reasons it was chosen for the exploration of the African coast were speed and the ability to sail windward. However, the caravel’s great lateen sail required a large crew, which was dangerous because the diminutive explorer could not carry vast amounts of fresh water for a large band of sailors. During the 15th century, Iberian shipbuilding underwent a new phase of design, involving an adaptation to the demands of ships of discovery. To give an idea of the elevated preparation of shipyards and shipping of the 15th century, Don João II of Portugal ordered a nao of 1000 tons to be built, in a time when they rarely exceeded 300 tons. The keel of this immense vessel had a length of 31.50 m and it was 50 m overall (16). There are records of other impressive ships from Portugal, such as São João of 1533/34, which was one and a half times the size of the largest Indian ships (17). Such ambition also called for changes in the caravel as a ship of discovery. Rather than using the technical knowledge of naval architects, these demands were taken on by skilled craftsman, who were capable of transforming the geometry of the vessel to suit the requirements of a sea-going explorer (18). For Columbus’s expedition in 1492, caravels were probably chosen as at least two of the accompanying vessels for the voyage. Santa María, however, is generally agreed to have been a nau. The Portuguese retained the lateen sails for their caravels, because they better suited their purposes on the African Coast. But by this time in Spain, the caravel had largely transformed from the caravela latina to the caravela redonda (19). It was now a three-masted vessel wielding a square sail on the mainmast and foremast, and a lateen sail on the mizzen. As in the case of Columbus’s Pinta, the caravel could often times be converted from a lateen-rigged vessel to a square-rigged vessel. This new sail arrangement provided the necessary adjustments to make the caravel what was commonly referred to as the best sailing vessel of its time. It continued to increase in size, but was still small enough to be easily maneuvered. As the ship became heavier, it also became beamier in order to increase the carrying capacity for each meter of length (20). The length to breadth ratios were now likely in the range of 4:1 to 3:1 (21). Its development over the centuries made it a viable option for exploration, trading, warfare, and piracy. The Islamic influence affected many subjects which relate to seafaring—geography, mathematics, astronomy, and medicine. The transcription of Arab manuscripts in the 13th century left many of these philosophies at the seaman’s dispense. Many devices, such as the astrolabe, compass, and sextant were applied to seafaring in innovative ways (10). Now that European nations were immersed in these philosophies spread by Muslims, many people became frightened of Muslim influence. Consequently, this resulted in a demand to increase the centralization of Christian kingdoms, which helped unite Europe (11). This collaboration influenced shipbuilding and led to a fusion of ideas, theories, and methods that became more and more widespread. Returning to the 13th-century caravel, a variety of forms can be seen. It is known from the flora of Vila Nova that these caravels were small and of limited capacity. This is understandable, considering during this period of their development they were likely primarily fishing vessels. Their shallow draught and low sides indicate their usefulness as such a vessel along Atlantic and Mediterranean coasts. However, it is also conceivable that these ships were employed for trade and, therefore, could have been fully decked at this time. Since many ships during this period were similar to the caravel in size and rigging, a tentative comparison can be made with other vessels regarding tonnage and keel to beam ratios. 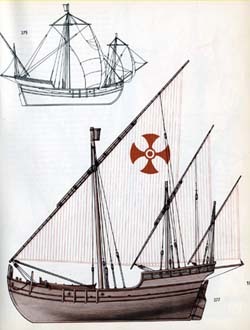 The 13th-century caravel is surmised to have been a lateen one-or two-master under thirty tons, with a keel to beam ratio of 5:1. This is rather high compared to the ratio of the ship during its last stages of development in the 17th century, which had a keel to beam ratio of 2.64:1 (12). These ratios and tonnages of the 13th-century vessel are very speculative, but as Elbl notes, 14th century records—dated AD 1307—from the Biscayan area mention small caravels with crews of nine men each. According to Azevedo, these manning ratios (in the 15th century) represent vessels of 18-20 toneis (13). Although during the 14th century there is little doubt that caravels continued to be utilized as fishing and commercial vessels, there is an odd absence of the ship (in records) which cannot be easily explained. Caravels are not mentioned in historical accounts other than the Biscayan records of 1307, nor are they depicted in the available iconography of the period. Despite this absence, there was definitely a shift in the size of caravels as they took over the functions of another light Portuguese vessel, the varinel. The varinel, which resembled the Atlantic balener, was better suited to sail in the Bay of Biscay than other southern ships of the same size. This shift may be indicative of transitions from a coastal vessel to one capable of faring well in the high seas. By the first half of the 15th century, this shift was noted in Catalonia. 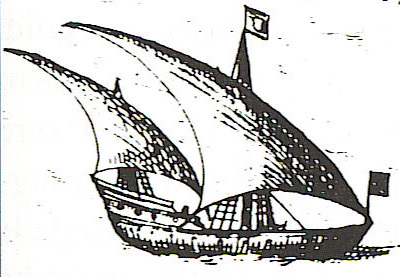 In an ordinance of 1438 issued by Alfonso the Magnanimous it is stated: “…we know that the settee was in other times a light oared vessel and now it is the heaviest ship, of greater board and capacity for long voyages; the same for the bark…today it is taken in general as a vessel of lateen sail that consists of three masts…(14)” Because of these reasons, it is plausible to assume that throughout the 14th century the caravel underwent alterations that made it somewhat more suitable for ocean voyages. These alterations included increases in carrying capacity. At this point, an examination of various documents and manuscripts can help describe the practice of Iberian shipbuilding, for they do not become available until the 16th century. Until records of shipbuilding practices were kept, such information was safeguarded in the minds of skilled masters who passed on the traditions orally from generation to generation, and by shared work experience. However, as Casado Soto points out, the combination of low life expectancy and the rigid secrecy that was practiced regarding this specialized knowledge ensured that these traditions would not survive in writing (22). These documents are useful tools for studying the history of shipbuilding, but caution must be taken when interpreting them. The various authors were influenced by their professions and the extent of their experience in shipbuilding is largely unknown. Nevertheless, they give information on raw materials needed for shipbuilding, as well as dimension and tonnage of ships. (1) Etayo 1971, 53-4; Elbl 1985, 543. (7) Michel 1876-70, 1, 153; Elbl 1985, 546. (12) According to the instructions set forth for a caravel of 11 rumos in Livro de traças de carpintaria, by M. Fernandez, 1616, 1995 reprint. (13) Azevedo 1934; Elbl 1985, 548. (14) d’Albertis 1892, 41;Elbl 1985, 549. Translation by this author. (19) The Spanish are credited as the first to have made this transition, which was largely done for the voyages to the New World. (22) Casado Soto 2001, 131. (23) Casado Soto 2001, 135. (24) Casado Soto 2001, 135. (25) Castañeda, Cuesta, and Hernández 1983, 209-23; Casado Soto 2001, 136. (26) Casada Soto 1988, 265-70. (27) Casado Soto 1998, 362-3. (28) Casado Soto 1988, 271-4. (29) Escalante de Mendoza 1985, 39-45; Casado Soto 2001, 136. (30) Casado Soto 1988, 294-375. (31) Garcia de Palacio 1944, fol. 88-109; Casado Soto 2001, 136. Azevedo, P. 1934. Documentos das chancelarias reaes relativos a Marrocos. Lisbon. Baker, J.G. 1979. “Islamic Influences on Iberian Seafaring.” Unpublished paper, Texas A&M University. Barata, J. da G. P. 1987. “A caravela, breve estudo geral.” Studia. 46:157-84. Barker, R. 2001. “Sources for Lusitanian Shipbuilding.” In Trabalhos de arqueologia, edited by F. Alves, 18:213-28. Lisbon: IPA. Cano, T. 1964. Reprint. Arte para fabricar, fortificar y aparejar naos de guerra y merchant. : La Laguna: Biblioteca de Autores Canarios. Original edition, Sevelle, 1611. Casado Soto, J.L. 1988. Los barcos españoles del siglo XVI y la Gran Armada de 1588. Madrid. ---------1998. “Flota atlántica y tecnología naval hispánica en tiempos de Filipe II.” In Congreso Internacional las Sociedades Ibéricas y el mar a finales del siglo XVI. Madrid.VI.II:339-64. ---------2001. “The Spanish Ships of the Oceanic Expansion. Documentation, Archaeology, and Iconography from the 15th and 16th Centuries.” In Trabalhos de arqueologia, edited by F. Alves, 18:131-62d’Albertis. 1892. Construzioni. Genova: Tipografia del R. Instituto. Edwards, C.R. 1992. “Design and Construction of Fifteenth –Century Iberian Ships: A Review.” MM. 78.4:419-32. Elbl, M.M. 1985. “The Portuguese Caravel and European Shipbuilding: Phases of Development and Diversity.” Revista da Universidade de Coimbra. 33:547-72. Etayo, C. 1971. Naos y Carabelas de los Descubrimientos y las Naves de Colón. Pamplona. Fernandez, M. 1989. Fac-simile. Livro de traças de carpintaria. Lisbon: Academia de Marinha. Original edition, Lisbon, 1616. Fernandez, M. 1995. Reprint. Livro de traças de carpintaria. Translated by Dr. Manuel Leitão. Lisbon: Academia de Marinha. Original edition, Lisbon, 1616. 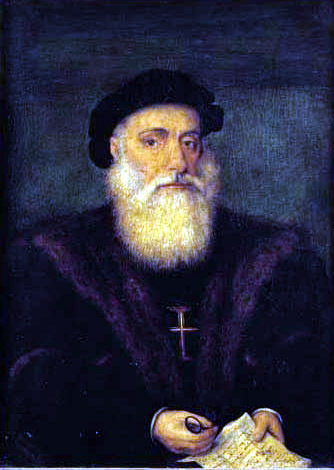 García de Palacio, D. 1587. Instrucción nautical. Mexico. ---------1944. Fac-similie. Instrucción nautical para navegar por el doctor Diego García de Palacio. Madrid: Instituto de Cultura Hispánica. Original edition, Mexico, 1587. Lyon, E. 1993. “The Niña, the Santa Cruz, and Other Caravels as Described in the Livro de armadas and Other Spanish Records.” The American Neptune. 53.4:239-46. Michel, F. 1867-70. Histoire du commerce de Bordeaux. Bordeaux. Oertling, T.J. 1988. “The Molasses Reef and Highborn Cay Wrecks: Two Early 16th Century Hulls.” In Underwater Archaeology Proceedings from the Society for Historical Archaeology Conference Reno, edited by J. Delgado, 116-120. ---------1989a. “The Molasses Reef Wreck Hull Analysis: Final Report.” IJNA. 18.3:229-43. ---------1989b. “The Highborn Cay Wreck: The 1986 Field Season.” IJNA.18.3:244-53. ---------2001. “The Concept of the Atlantic Vessel.” In Trabalhos de arqueologia, edited by F. Alves, 18:233-40. Oliveira, F. 1991. Fac-similie. 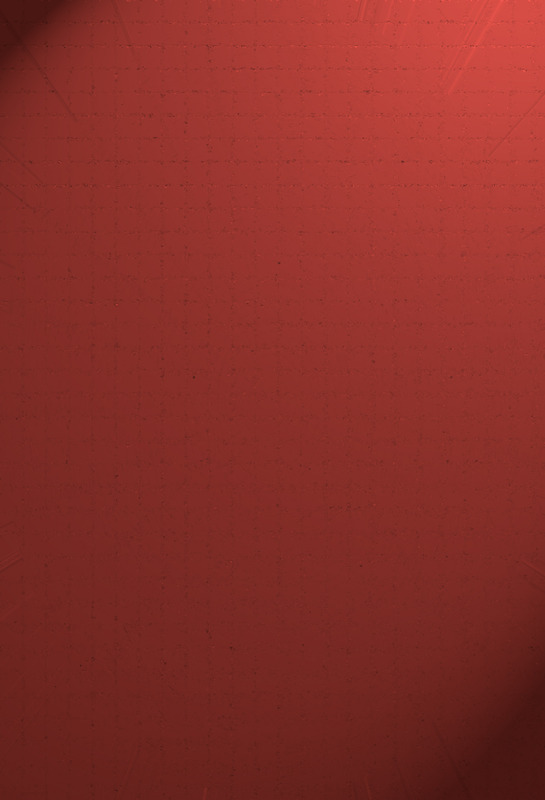 Livro da fabrica das naos. Lisbon: Academia de Marinha. 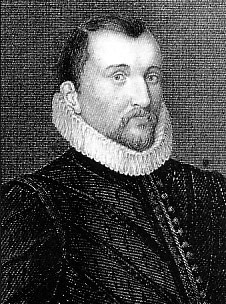 Original edition, 1580. Sarsfield, J. 1985. “From the Brink of Extinction.” Wooden Boats. 66:84-9. Unger, R.W. 1980. The Ship in the Medieval Economy, 600-1600. Montreal: McGill-Queen’s University Press.